Pain in any part of your body can grab your attention. Pain signals are your body’s natural way of communicating to your brain that something just isn’t right. This also applies to your mouth. In fact, dental pain can be quite disruptive. Some people find it difficult to eat, sleep or even concentrate when they have tooth pain. While you may be desperate to get out of pain, it is critical that you avoid certain things when seeking help for your toothache. Don’t go to the ER. Unless you have a bad cut or uncontrolled bleeding in the mouth, a visit to the ER is not the best place to get emergency dental treatment. ERs are not equipped with the proper dental equipment and trained professionals it takes to diagnose and treat dental concerns. It can not only be ineffective, but it may even do more harm than good. Only a dentist can relieve your pain while also addressing the root issue of your dental discomfort. Don’t ignore it. Although dental pain is difficult to ignore, don’t try and “power through” a toothache. 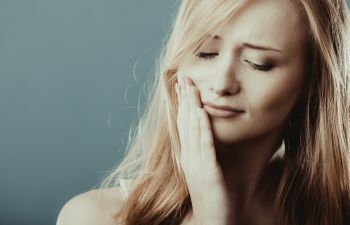 If your dental pain is related to an infection or decay, the problem will just get worse and may even spread to nearby teeth and the underlying tissues and bones that support your teeth. Seeking prompt dental treatment can save your tooth as well as protect your wallet from costly repairs! Don’t put aspirin on it.Contrary to circulating rumors about putting aspirin on a toothache, this is not a recommended remedy. Aspirin can burn the gum tissues and fail to provide proper relief. Instead, rinse your mouth with warm water and gently floss around the tooth. If the pain still persists, call your dentist for an emergency dental appointment. Don’t self-diagnose. We all do it. When we suffer sudden pain in our body, we scour the Internet for answers and potential remedies. Avoid the temptation to self-diagnose yourself. Let a trained dental professional and advanced dental imaging identify an accurate cause of your symptoms. Jumping to your own conclusions could result in worsening pain and neglected infection or decay. At Mitzi Morris, DMD, we proudly offer full-service dental care to our patients, which means we can handle all types of dental emergencies. We encourage you to call our office if you are unsure whether or not your dental pain warrants an appointment. It is always better to be safe than sorry – especially with your smile!